This is a good starter set! 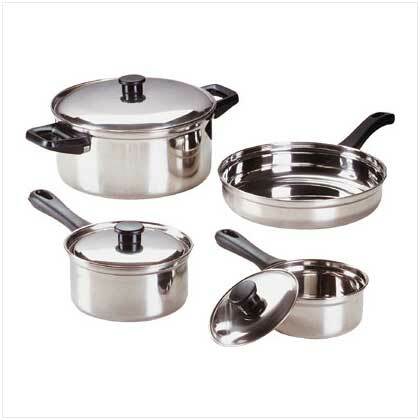 Try this nice sized 7-Piece Stainless Steel Cookware Set for a first apartment, a small kitchen, or a beginner cook. Lid for Dutch oven also fits the fry pan. Stainless material Is hard working, durable, and performs well in the kitchen. Shiny interior Makes cooking a breeze and cleanup easy. Long handles Are easy to grip and have hang-up holes for easy storage.